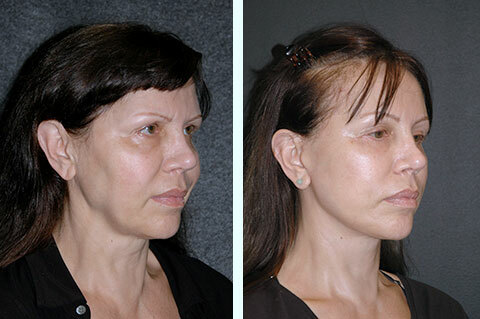 Facial Fat Transfer Correction Before and After. 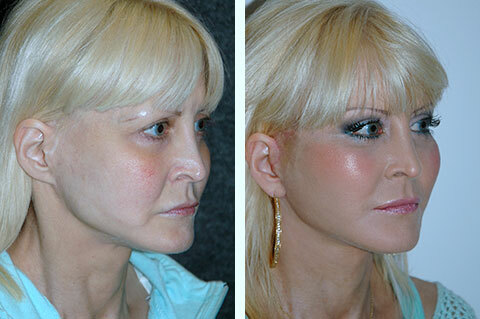 This patient had a facial fat transfer 8 years prior with another doctor. As she aged the fat grew and hypertrophied and weighed the face down, stretching it out and making it look droopier and wider. Doctor Jacono performed a fat transfer revision with micro-liposuction and a mini face lift to tighten the facial muscles and remove excess facial skin to create a more balanced, thinner face that looks young and rejuvenated. Doctor Jacono specializes in fat transfer revision, fat transfer reversal, facial fat graft removal and facial fat transfer correction. Doctor Jacono performs fat grafting and stem cell facelifts himself and it is a powerful modality to reverse facial aging. The problem is that it can be overdone or the fat can be injected into the wrong places in the face requiring fat transfer revision. Adding volume back to the face when we age makes sense because our faces become somewhat deflated which contributes to its drooping. As an analogy think of a plush grape losing its volume and turning into a raisin that has folds and wrinkles. Both non-surgical fillers, such as hyaluronic acid fillers Voluma, Juvederm, Restylane, and fat can be used to reverse some of these problems. With fat injections, also referred to as fat transfers or fat grafting to the face, doctors take fat from a part of your body, such as your stomach, hips or thighs, and inject it to fill folds, wrinkles and more. Fat injections do require surgery but last longer than hyaluronic acid fillers, and in some cases can be permanent. Common places injected include; the nas0labial folds, which are the lines that connect your nose to the corners of your mouth; the marionette lines, which extend from the corners of the mouth down to the chin; and in the chin crease, to achieve a more youthful appearance. In areas of the face where there is a lot of motion or movement, the fat graft take rate is lower and the fat will not persist as well. Non-surgical fillers tend to dissipate more rapidly in these areas as well. Fat and fillers can also be injected along the jawline to help provide definition and hide early jowls, and in the cheek area to add volume to cheeks that have dropped. Doctor Jacono believes that the biggest myth about fat grafting and fillers is that cheek injections can lift skin and jowling in the lower part of the face and jawline. He sees many patients in consultation who have had too much fat and filler in the cheeks to try to accomplish this who looks distorted and caricaturesque, and want this problem reversed. This and other problems with fat and fillers will be discussed below and how to fix it. As we get older the cheeks drop as the facial soft tissues and skin become more loosened. Adding fat in the upper cheek does not lift the face but creates more volume which can make the already fallen face more descend more. Further it makes the cheeks appear unnaturally full. Overly filled cheeks with fat is a common problem that Dr Jacono corrects with a minimally invasive procedure involving microliposuction and a mini ponytail facelift. Facial Fat Transfer Reversal Before and After. This patient had fat grafting to her jawline and cheeks to attempt to lift her face, but it created a broad, full and masculine appearance. Doctor Jacono performed microliposuction to debulk the fat along the jawline and performed a dep plane facelift to correct her dropped cheeks and create a defined jawline. While fat and filler injections work wonderfully at the right time in the facial aging and when done in the right quantities, and in the right facial locations, there are typical problems Doctor Jacono sees. He believes that most patients get eight to 10 years of good use with the filling approach, especially when you start in your early forties (most commonly) or the late thirties. The problems begin as we continue to age. The facial tissues loosen more, and the same amount of filler does not achieve the same results they delivered when you were younger. Many doctors will add more and more fat or fillers to fill up the looser tissues. As more and more fat or filler is added the face starts to look overfilled; it doesn’t look younger. The face becomes wide along the jawline and cheeks which can be somewhat masculinizing to a woman’s face. It looks distorted and facial identity is lost. Patients often say “I don’t look like myself.” This is when they will seek a surgeon for fat transfer revision for a face fat transfer gone wrong. When you notice that your fat injections or fillers are not working like they once did, this is the time to consider a procedure like a mini face lift, and not overfill your face. Doctor Jacono regularly sees patients in consultation who have spent tens of thousands of dollars and the effects of the treatments aren’t working for them anymore. The best analogy to understand when to consider surgery is think of a pair of pants that too big for you, there is too much fabric. If the pants are 1 size too big it is acceptable to pick up the slack by putting on 5 pounds, to fill in the jeans; this is like when we start adding fillers in our forties. When the pants are 3 sizes too big it would not look good if we gained 30 pounds to fill in the baggy pair of pants, you need to go to the tailor to take them in a few sizes. This is what happens as many continue to age. They are afraid of surgery so they keep on adding too much fat or filler to fill in the baggy pants, creating a bloated look. This is where the judgement of your doctor comes in, knowing how much to do, not overdoing it, and telling you when it is time to consider surgical intervention. One thing to strongly consider with facial fat grafting is that the fat behaves like fat from your abdomen or thighs; as you put on weight it will grow. This is especially important if you are a pre-menopausal woman. If you have fat grafting when you are younger when you go through menopause and your metabolism changes the fat cell will enlarge and the face will become wider and more distorted. It is important to maintain your weight if you have had fat grafting. Facial Fat Transfer Correction Before and After. Both of these patients had prior surgeries not performed by Doctor Jacono. They are in their sixties and had been overfilled with fat grafting in their cheeks and had superficial facelifts that tightened the skin and the superficial SMAS. Doctor Jacono restored more balance to these faces by removing the extra fat through a facelift revision approach and repositioning the deep musculature of the face and cheeks reducing the width along the jawline and recreating more of a heart shaped face. Knowing when to stop filling the face is also important because too much filler stretches out the face ensuring you will need a mini face lift earlier. 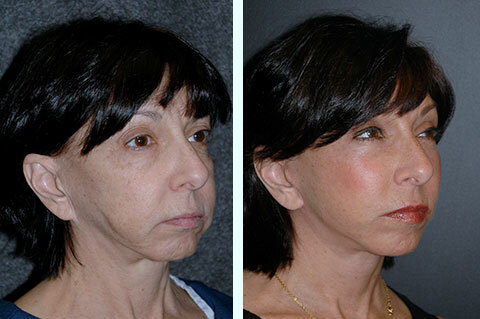 This process is called tissue expansion, as we fill in the cheeks and jawline extra skin is created over many years. The best way to think about this is a pregnant belly. After giving birth (when the fat or filler goes away) the skin is loose and hangs more. This effect is worsened with age because the facial skin and muscles lose elasticity and do not bounce back the same way as you get older. Additionally, fillers have weight and over many years gravity will pull that weight down and make the face fall more rapidly. When done conservatively and with smaller amounts and never overfilling the face these risks are lessened. Unfortunately, Doctor Jacono sees many women in their mid to late forties who have been overfilled and now need a min face lift because the fillers have made their face droop earlier than it should have. 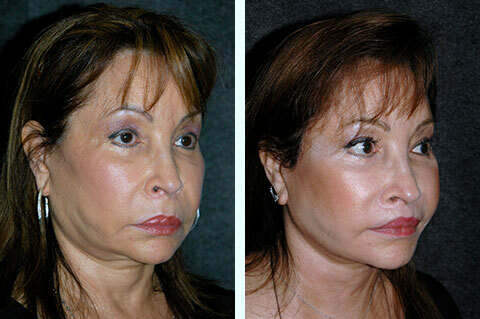 Facial Fat Transfer Correction. This patient had fat grafting to her jawline and cheeks to attempt to lift her face, but it created a broad, full and masculine appearance. Doctor Jacono did not remove the fat, as the patient wanted cheeks that were fuller just repositioned higher. He performed a deep plane facelift to reposition the cheeks and grafted fat vertically creating a more balanced and youthful appearance. When your face has been overfilled the solution can be non-surgical or surgical depending upon the diagnosis of your problem. If your face has not lost too much elasticity, removing some of the fat can be performed non-invasively or minimally invasively. This is usually performed preformed to remove irregularities or asymmetries in the fat grafts. An example can be lumpiness in the cheeks. Also if too much fat is placed in a certain are it can be reduced without taking all the fat grafting out. Doctor Jacono will begin with injectable sessions with kenalog and 5 florouracil which have been shown to help fat grafted cells reabsorb and reduce scarring around the fat grafting which can create irregularities. Treatments sessions are 4 weeks apart. After 4 sessions if no significant improvement is seen micro-liposuction can be attempted to directed areas. Microliposuction is performed with very thin cannulas not like lipouction that you would perform to reduce saddle bags or fat on the abdomen. This is performed under local anesthesia so you do not need general anesthesia. Sometimes 2 or 3 sessions are required if you had excessive fat grafting. For those whose faces have lost more elasticity, are droopy, or have been stretched out by excessive fat grafting or filler, Doctor Jacono performs a combination of his New York facelift with filler removal or micro-liposuction. If you simply remove the filler or fat the face will hang, so a mini face lift performed concurrently is a must. A perfect analogy is if you lose a lot of weight, the extra skin that has been created by being heavier for many years will cause the abdominal skin to hang. Doctor Jacono uses advanced facelift surgery techniques that lift only under the muscles called the deep plane facelift, not the old-school, skin-pulling procedures that make people look tight. The incisions are behind the ears and he performs a short incision so that the scars are not visible and you can wear your hair up in a ponytail facelift. Combining this with debulking the extra fat or filler will restore your facial identity that was lost with overfilling. In the end you will 10 to 15 years younger, and you will look natural like yourself again.